Buying a home has been a status symbol for a long time. However, shifts in cultural norms and value systems are challenging the notion that owning a home means you've "arrived." Don't get it twisted, consumerism in America is at an all-time high, but more people are evaluating what really makes them happy. And the more they search, the more they are finding that happiness isn't necessarily found in the house with the white picket fence. Buying a home can be a great investment if done strategically. It's also a huge commitment, and can financially ruin you if things go sideways. Deciding if buying a home is the right move for you can be tricky. There are a lot of unknowns, but one of the most important factors to consider is your career. Here's how buying a house could affect your career path. When you buy a home, you put down roots. Detaching from a rental is so much easier than trying to get out from under a home you've purchased. Most rental agreements build in an early exit component. Leaving before your lease is up is expensive, but it's a lot cheaper and easier than defaulting on a mortgage. Once you pay the fee for breaking the lease — you're done. There are very few repercussions as long as you honor the agreement. It's hard to be ambitious and chase your dreams when you are tied to a home in a particular area — especially if that home is in a rural location far from the city. If you're career-focused and driven, home ownership may not be right for you at this moment. If you don't like the neighborhood in which you rent a home or apartment, if you're interested in changing jobs within the same area, or just want a shorter commute, you can remedy these issues easily as a renter. Most rental agreements range from six months to two years, versus the typical 30-year home mortgage. This is especially important in today's job climate. Large companies are downsizing from large corporate headquarters to smaller satellite offices in multiple areas. If you are transferred to a different area — depending on the new location — you are faced with having to decide between a longer commute, frequent travel, relocating, or finding a new job. Handling a job transfer is difficult as it is, but adding a home to the mix really muddies the water. The internet has revolutionized how we find employment. Let's say you're looking for a position and you find your dream job using a virtual job board. You meet all the job requirements. You have the necessary experience and expertise to fill the role. The pay is decent. And it's the perfect next step in your career. You interview for the position and you're offered a job running a division in Albany, New York. However, you live in Yuma, Arizona. Working remotely is not an option. And you purchased your first home 18 months ago. What do you do? If you're in a profession that is transient by nature, you want to think long and hard before purchasing a home. Buying a home is all about timing. Just because you can afford a home doesn't mean you should buy it. The hassle of buying and selling can wreak havoc on your finances if you aren't careful. A lot of factors causing a home's value to either appreciate or depreciate are out of the hands of the buyer. Just because a house is cute, has great curb appeal, and an open floor plan doesn't guarantee that it will hold its value and appreciate over time. You have to consider the neighborhood, natural disasters, city construction, future development plans, the presence and strength of a homeowner's association (HOA), and a host of other factors. Consider taking the money you intend to use as a down payment and investing it in stocks or mutual funds. The first rule of investing is to diversify, and spreading the money over several solid traditional investments may be a better bet long-term than sinking it all into a personal property. Also, traditional investments don't negatively impact your career. If you move, change careers, or go into business for yourself, you continue earning interest on what you've invested. If owning a home is something you've dreamed of and fits your goals and values — go for it! But do your homework, and consider the timing of your purchase. Understand that every decision has consequences. 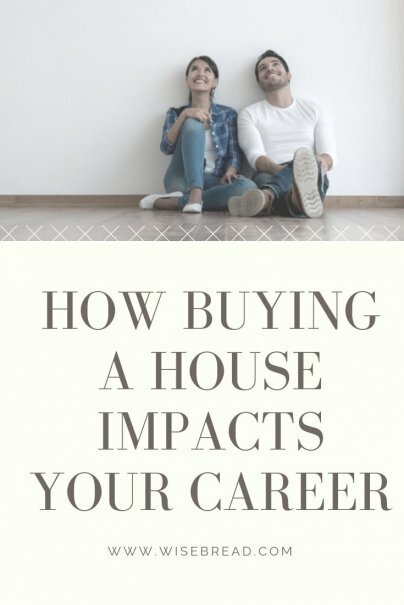 Buying a home could impact your career goals, coax you into compromising your professional vision, and slow or hinder your success. Proceed with caution.